Fairy tales are fascinating.Â Stories are great, but it takes special staying power to become a story that so saturates a popular culture that it is passed on from generation to generation.Â They have messages for us now but meant a whole lot more back when they were originally created.Â Now there is a whole new look being taken at some of the classics and itâ€™s available on DVD with a great new spokesman. Starting this January 6th, now available on DVD from HIT Entertainment and Lionsgate Productions comes the next great adventure in the lives of our favorite dinosaurs.Â Barney â€“ Once Upon A Dino Tale is ready to come out and play in your living room and take your children on a magical journey into the land of fairy tales.Â Bring home this entertaining and informational show today! 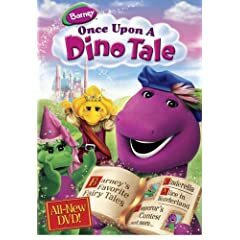 In this DVD, Barney and all of his friends go on a magical adventure through a world of fairy tales.Â Princess Rosey decides that she is going to have a party and wants her jester, Jingles, to gather up the very best of them from near and far.Â Barney and his friends want to help too, so they share the stories they love and end up reliving them.Â The stories included in this DVD are Alice In Wonderland, The Fisherman And His Wife, Cinderella, The Emperorâ€™s Contest, The Lion And The Mouse and Princess Pumpernickel. As a special feature, this DVD also includes a sing-along jukebox, where you can play the different songs found on this DVD and then sing along with them.Â Itâ€™s a wonderful treat that is especially enjoyable for young fans of this show. This show brings us a very interesting and original take on some of the classic fairy tales we have all grown up knowing.Â It is a fun journey through familiar tales.Â As usual, there is plenty of bright colored fun and a whole lot of education and positive character building.Â Barney has always been a delightful influence on the lives on many through his teachings on friendship, self-worth, teamwork, safety and a host of many other issues.Â Itâ€™s great to see that he is someone who can be trusted when it comes to training our children in ways to be better people. This Tale deserves to be told. 7 users commented in " Movie Review â€“ Barney â€“ Once Upon A Dino Tale "